These awards, a new innovation from the Jersey New Zealand Board, are designed to acknowledge both members herd achievements and their support for the Association through use of its products and services. In essence, there are five areas in which members must ‘qualify’ for consideration of the award. 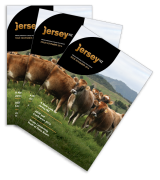 5) They must submit at least one heifer for consideration for the Jersey Genome programme. To acknowledge the number of years the breeder has achieved the award, a number will appear at the end (For example, JNZ Services Award 1 indicates one year of meeting all criteria).Each recipient will receive: A certificate, authorisation to use their award level in any form of advertising, including in any sales catalogue where an animal of their breeding is featured (either in the footnote or foreword). This award is for Jersey New Zealand members whom the clubs feel epitomises all things Jersey. This award is made to the person who, in the opinion of Jersey New Zealand Board, has done the most or been the most active, in promoting and publicising the Jersey breed and the Association. The award covers all phases of a breeder’s activities, including testing, showing, breed promotion and administration. Must be New Zealand born irrespective of ancestry. After meeting criteria, the bull with the highest BW (where equal BW, higher reliability wins). JT Thwaites Sire of the Season is calculated after the May Animal Evaluation run. In recognition of outstanding services to the Jersey breed and Jersey NZ, nominated and presented by the Jersey NZ Board for activities over the preceding 12 months. The Cyril Dermer Cup for 2018 is presented to Julie Pirie. While a relatively new member to Jersey NZ, Julie’s contribution to the breed and Association has become significant over the past 12 months. While her primary contribution has been with youth, Julie’s influence is also felt at representational level through her involvement on two Jersey NZ Committees. Julie believes strongly in community, and for a few years now has been offering children in her local community the opportunity to come onto her farm to raise an animal for 12-14 weeks and show it at the school calf club. Julie has noticed that with having a group of up to 20 primary school children on farm, a number of important life and social skills are also learnt alongside good animal husbandry, skills such as team work, helping each other, work ethic, patience, accepting praise and learning to deal with disappointment. Julie is also involved with mentoring teenagers, encouraging and helping them at A&P Shows and for the Semex Youth Challenge at the NZ Dairy Event. In January 2018 Julie, along with Matt Satherley, organised and led a study tour group of 10 mainly Jersey youngsters to participate at International Dairy Week in Australia. The team performed admirably, and many of the youngsters were then asked to exhibit in the Youth Show with some good results. More recently, Julie has been elected as Chair of the Donald Pearson Farm Trust. Donald Pearson was a Milking Shorthorn breeder who left his farm near Whitford, Auckland, to the New Zealand Young Farmers to be used as a demonstration farm for city kids. Julies influence is being felt already with the introduction of Jersey heifers on to the farm. Within Jersey NZ, Julie is also serving on both the very active Industry Affairs Committee and the recently formed Youth Committee to develop the youth programme further for Jersey NZ. She is President of her local Thames Valley Jersey Club, and is also a Fonterra Shareholders Councillor. The Board of Jersey NZ believes that Julie’s passion and advocacy for both youth and the Jersey breed make her the ideal recipient of the reactivated Cyril Dermer Cup. Provided via nomination with 3GP included annually. Only for cows that have completed a lactation in the season relating to the award (e.g. season 2016/17 for award in 2018), are registered, J16 and owned by a Jersey NZ member.